Varilux E series is ideal for new progressive lens wearers. It delivers stable and sharp vision from the moment you try on your new spectacles. Adapting to new varifocal lenses quickly and easily is important. It gives you visual freedom and comfort. Varilux E series lenses can reduce image distortion, making it easier than ever before to wear varifocal lenses. From the moment you try them, you will experience great vision, enjoying true images and enhanced visual comfort. Varilux E series lenses have a built-in technology to achieve quick adaptation. This is called Swim Control and it's unique to Varilux E series. Swim Control technology refines the curvature of the lens to reduce 'swim' effect and image distortions, something that can be disorientating for new wearers. You can wear Varilux E series lenses all day with ease, in all situations. We're committed to testing the benefits. We conduct systematic wearer tests to guarantee proof of benefits. 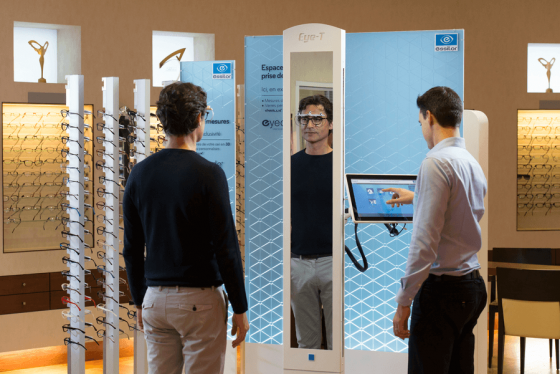 Get Varilux E series with your lens solution at a partnered optician. With Eye Protect System applied, your lens solution helps protect your eyes from harmful blue-violet light and ultraviolet light all day, everyday indoors and outdoors. This versatile lens enhancement reduces reflections from all angles for better clarity of vision and enhanced lens aesthetics. Ideal lens for wearers who spend their day both inside and outside and want a lens that seamlessly adapts to the perfect tint in every light. Available in 3 iconic colours.